No case of swine flu has been reported so far in the hill state, although one person of Dehra, who reportedly travelled along with the infected Jalandhar boy, is under watch. An alert has been sounded and the health department has been fully geared up for any eventuality. After dithering on the issue of unbundling of the state electricity board for about four years, the government has initiated the process for its restructuring. The Union Government would have to act in coordination with the state government. Chief Minister Prem Kumar Dhumal stated this when asked to comment on a statement of HPCC spokesperson Kewal Singh Pathania that the Union Minister for Steel Virbhadra Singh would bring Prime Minister Manmohan Singh to Dharamsala and get the foundation stone of Central university laid here. MIT College of Engineering and Technology, the first engineering college in private sector in Hamirpur district, situated at Bani under Badsar sub-division, has announced to start its first session from August this year. The special investigation team of the CID probing the alleged leakage of PMT question paper today quizzed 10 students from a local coaching centre whose name figure in the top 50 ranks. The Institute of Himalayan Bio-resource Technology (IHBT), a constituent laboratory of the Council of Scientific and Industrial Research (CSIR), celebrated its 25th foundation day today. It is another milestone for Dharamsala. The first cricket match-the finals of the Jaypee Cement 20-20 Tournament-was played under floodlights for the first time last evening at the international Dharamsala cricket stadium. The floodlights of the stadium were visible from every part of Dharamsala and its surrounding areas became an attraction for residents. Himachal Forests, Environment and Parliamentary Affairs Minister JP Nadda represented the state’s case before the Central Empowered Committee (CEC) appointed by the Supreme Court to present a report regarding request of the Himachal government to allow farmers here to fell their khair trees on their private lands on which the court has presently imposed a ban. It was a momentous day for people of landlocked Dodra Kawar in Shimla district when it was connected with the rest of the world with opening of the first ever motorable road today. Even as the dilemma over opening up green areas in the town for construction continues, the report of the high- level committee to look into the contentious issue is likely to be placed before the Cabinet at its next meeting at the end of this month. In a bid to check fire mafias torching forests, the forest department today lodged two FIRs against one Kapur Chand, a resident of Kotla in Bhungar protected forest in Nachen range, and another against an unidentified person in Dran demarcated protected forests in Gohar, for the first time in history. The Indora police yesterday arrested retired tehsildar of the Revenue Department Ram Chand Kaushal along with his brothers Dalip and Jagdev, residents of Raja Khasa, for their alleged involvement in tampering with a registered will executed by deceased Santokh Singh. The Special Investigation Unit of Mandi today arrested Nand Kishore, a resident of Meerabai Chowk, Ropar, under the NDPS Act, after recovering one kg of charas allegedly from his possession. Six persons were killed in three separate accidents in the district today as two cars and one truck met with mishap. The government does not feel the need of surveillance of visitors, including foreign tourists, who throng the state in large numbers, as there is no international airport in the state. Foreign tourists go through the surveillance net after landing at the international airports. However, a strict watch is being kept on visitors in places like Dharamsala and Bhagsunag which attract large number of foreign tourists. Principal Secretary Deepak Shanan said all necessary steps had been taken to deal with the epidemic, which include setting up of rapid response team, stocking of tamiflu medicine, personal protective equipment, masks and other required items. Besides, a state-level rapid response team under Dr Vinod Mehta had also been constituted. In addition, rapid response teams had been set up at the two government medical colleges located in Shimla and Tanda, he added. The field staff has been asked to keep a watch on suspected cases with symptoms of the disease. Head of the state-level team Vinod Mehta said since the symptoms were like common flu with cough, fever and bad throat, case definition was important for detection. The visitors coming from a country where cases of swine flu had been reported and those who had come into contact with persons already infected by the disease, were required to be monitored closely as the incubation period was more than seven days. DHARAMSALA: Swine flu scare haunted health authorities of the district today after detection of a case in Jalandhar district of Punjab yesterday. Sources in the health department told The Tribune that one resident of Dehra was travelling with the swine flu patient who was admitted in Jalandhar yesterday. After the district health authorities got information regarding the fact, they dispatched medical teams to Dehra to identify the person, fearing that he might have also got infected. The sources said the health department officials had located the person in Dehra area. Kangra civil surgeon Anil Mahajan, when contacted, said medical officers were conducting check on the identified person. Whether he was infected or not could be said tomorrow, after the results of medical tests were received, he said. When asked what steps were being taken to check foreign tourists, the civil surgeon said they had issued directions to concerned medical officers to keep a check in their respective areas. The medical officers have been directed to keep a vigil on foreign tourists reporting high fever or other symptoms indicating swine flu. However, sources in health department said foreign tourists were already examined at international airports for the symptoms and there was not much to fear here. The authorities of Tanda medical college also said they were ready to tackle any kind of eventuality. MANDI: Even as the state health and family welfare department has sounded a statewide alert on the infection to district hospitals in the state, neither the zonal hospital, Mandi, nor the regional hospital, Kullu, have “flu medicine and kits” to meet any emergency situation, although the chief medical officer (CMO), Kullu, and CMO, Mandi, had set-up the “rapid action response team” to deal with such cases. The Kullu team has an epidemiologist, but there is no epidemiologist at zonal hospital, Mandi, which is being looked after by Dr TC Mahant, a pubic health expert. However, Dr Sudarshan, CMO, Kullu, said they had set up a three-member team headed by an epidemiologist and had quarantined six beds in the hospital for patients with symptoms of fever with cold, vomiting, flowing eyes or stomach ache. “But so far, no case has been detected in Kullu district,” he said. As a first step towards compliance with the Electricity Act, 2003, a notification is being issued for vesting the assets of the state power utility in the government. The board will cease to be an entity after the notification, likely to be issued late this evening or tomorrow under Section 131(1) of the Act for the purpose of vesting of functions, priorities, interest, rights, obligations and liabilities of the board in the state government for re-vesting in a corporate entity or entities. Till that time, it will be managed on the behalf of the government by a committee headed by special officer (chairman of the board) and comprising members of the existing board. Uncertainty will continue as it will take some more time for the government to finalise the models for restructuring. It had agreed to consider the model submitted by the joint front of employees and engineers under which reorganisation was to be carried out without unbundling by creating business units for generation, transmission and distribution. It wanted board to be reorganised into one company which should handle all three activities. However, the Government of India had, in its advice to the state, made it clear that functions of distribution and transmission had to be completely segregated under the Electricity Act, 2003. It had also stated that the consent given for continuation of board as STU (state transmission utility) and a licensee under the Act would expire on June 15 and if necessary steps were not taken to comply with its provisions, the board would cease to be a league entity thereafter. The proposal, along with the advice received from the Government of India, will be submitted to the Advocate General and Law Secretary for their opinion. In case the proposal is not at variance with the legal advice, it will be sent to the Centre for its advice. The matter will be discussed again with the joint front after receiving the advice. Further, the transfer scheme for re-vesting under Section 131(2) will be finalised within a period of six months. 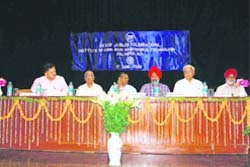 Dhumal said the location of the university had to be decided by the state government. It was decided to set up the university in Dehra sub-division as ample land for the project was not available in Dharamsala and its surrounding areas. He said Virbhadra Singh and Anand Sharma, the Congress Union ministers from the state, had met him, but none of them raised the issue. There were many spokespersons for Virbhadra Singh and they were issuing statements without considerable base, he added. The location of the proposed university has been the bone of contention between the ruling BJP and the Congress. The state government had decided to set up the university in Dehra sub-division. The decision was justified on the plea that more than 500-acre land was required for bringing up a Central university. However, so much land is not available in Dharamsala. The Congress leaders are, however, insisting that the university was initially planned to be set up at Dharamsala. It was only being shifted to Dehra as it fell under the Hamirpur parliamentary constituency. The issue was also raised by the Congress leaders during the recent Lok Sabha elections. After the Congress was voted to power in the Centre, the leaders of the area once again raised the issue of bringing up the university in Dharamsala. The tiff over location of the university between the state and the Central government might delay the prestigious project in the state. Dhumal also said Anil Sharma, a Bollywood producer, had planned to shoot his next film in Himachal. Many other producers would also be invited to shoot their film projects in the scenic valley of the state, he added. He said the MIT being the first engineering college in Hamirpur district in private sector is committed to provide best and quality education for the people of the state in general and Hamirpur district in particular. Thakur said the Kailash Educational Trust is already running three years diploma courses in engineering in the above four streams at MIT Institute of Polytechnic, Bani, and our students have secured three merits in the state. Chief executive officer (CEO) and vice-chairperson of the trust Sumiti Thakur was also present in the press conference. SP (CID) Rajinder Bhatia, heading the team, questioned the students from the coaching centre. With 23 students from the coaching centre and seven of them making it to the top 10 positions, the institute is facing allegations of having leaked the PMT question paper. The inquiry in this regard has been entrusted to the CID wing of the police. The successful students were also grilled by a panel of three experts from Himachal Pradesh University (HPU) to assess their calibre and see if they cleared the examinations on their own. “Practically all students did pretty well before the panel of experts from the HPU which further diminishes chances of the paper having been leaked,” said a senior police officer. It was on the basis of a complaint filed by a parent that the government had ordered an inquiry. With no specific clue about the paper having been leaked even the complainant has reportedly told the police that he has no evidence and his doubt stems only from the fact that 23 students of one institute cleared the PMT exam with flying colours. The owners of the coaching centre while welcoming the inquiry had said the moment they get a clean chit they would initiate legal proceedings against the complainant. Addressing the gathering through teleconferencing Prithviraj Chavan, Union Minister of State for Science and Technology and vice-president of the CSIR, highlighted the importance of the fragile eco-system of the Himalayas and related issues like climate change. He expressed hope that endeavours of the IHBT in development of bio-fertilisers, bio-pesticides, new cropping system and conservation of plant biodiversity would play significant role in sustainable utilisation of bio-resources. Professor Samir K. Brahmacahri, director-general, CSIR, who also addressed through teleconferencing, revealed that the CSIR would establish a high-altitude research centre involved in societal programmes, climate research and installation of permanent weather monitoring system and other such activities. In his presidential address, Prof VL Chopra, former member of the planning commission, appreciated the contributions of the IHBT. While speaking on the occasion chief guest Prof Jai Rup Singh, Vice-Chancellor, Central University, Bathinda, Punjab, appreciated the world-class infrastructure and manpower at the IHBT. Presenting the annual report of the IHBT, Director of the IHBT Dr PS Ahuja said the institute is focused at the cutting edge in areas of biotechnology, natural product research, nanobiology, climate change and biodiversity conservation. Pioneering work carried out in plant virology helped in establishment of an accredited laboratory for detection of viral infection in economically important plants. Highly sensitive viral diagnostic kits of commonly prevalent viruses have been developed which enable detection of viruses at a very early stage and are extremely useful for quarantines. Prof Anupam Varma, former vice-president INSA, opined that the IHBT had done remarkable efforts to revive the century-old dilapidated tea industry in the state. The local residents who earlier never showed much interest in the Ranji matches conducted here, were present in large numbers at the cricket stadium yesterday evening attracted by the floodlights. Chief Minister Prem Kumar Dhumal inaugurated the finals of 20-20 tournament. While addressing a press conference along with the HPCB chairman Anurag Thakur he said the government was planning to develop Dharamsala as a sports town. He said the state government would extend all help to the HPCB in developing the sports stadiums across the state. He said the HPCB would also be requested to create other sports facilities in the state. Anurag Thakur said cricket clubs from across the state participated in the tournament. He said the Centre backtracked from providing security for the IPL tournament in the country this year. This deprived Dharamsala of four IPL matches. However, still the HPCB went ahead with the installation of floodlights in the stadium at a cost of Rs 5.5 crore. Another indoor cricket stadium is also being constructed at a cost of Rs 8 crore. Till date 35 crore have been spent on the construction of the Dharamsala cricket stadium. He said the HPCB was not being able to find a suitable piece of land for bringing up a five-star hotel in Dharamsala. To compensate for that we are planning to request two hoteliers of the region to upgrade their facilities to five-star level. Anurag also said Lalit Modi, chairman of the IPL, has promised two matches for Dharamsala in April next year. Meanwhile, in the finals of Jaypee Cement 20-20 cricket tournament Poanta Sahib defeated Bitta XI (Una) to win the trophy. Batting second, Poanta Sahib made 118 for six in reply to Bitta XI’s 117. The Chief Minister presented cheques for Rs 3 lakh to the winning team and Rs 2 lakh to the runners-up. Nadda met chairman Jai Krishan and Member Secretary Sanjiv Chadha of the committee here last evening and apprised them regarding the difficulties presently being experienced by lakhs of farmers due to this ban on felling of khair trees which were grown on their fields and were an additional source of income. Nadda pleaded that khair was one of the main sources of their income as it was their cash crop and ban on this felling had deprived them of their family supporting income . The CEC assured the minister that the committee would fully present the viewpoint of the state government before the SC and highlight the difficulties faced by farmers. Chief Minister PK Dhumal inaugurated the 61-km Larot-Kawar road constructed through the difficult mountain terrains. It forms part of the 92-km Rohru-Chirgaon-Larot-Dodra Kawar road. The road up to Kawar had already been constructed few years back. The construction of Larot to Kawar portion was a difficult task due to hard terrain and varied geographical conditions, which was completed at a cost of Rs 27 crore. The people of Dodra, Jiskun, Jhakha Pandhar, Kiterwari Dhanerwari and Chaidhar villages having a population of over 5,600 would benefit by the road. He announced Rs 9 crore for upgrading of the road for smooth flow of traffic through the new road. Till now they had to cover about 20 km on foot to reach Rohru from Uttarakhand side, which was the shortest route. Despite the opening of Larot-Kawar road, the state government is pursuing the matter with the Uttarakhand government for constructing the section of road falling in its territory at the earliest. Dhumal said the road to Kawar would revolutionise the local economy, as it would open new opportunities for promoting tourism, agriculture and horticulture in the area. Farmers would be able to transport their produce to markets. The administration would not have to transport essential commodities on mules in summer and by helicopter in winter. The priority of the government was to construct link roads to Jiskun (8 km), Jhakha (6 km) and Kiterwari (2.9 km) at a cost of Rs 8.36 crore. Earlier, the CM was accorded a rousing reception by the people of Rohru sub-division on his arrival. Welcome arches were erected en route Rohru to Kawar. He was accompanied by Horticulture Minister Narender Bragta, MP Virender Kashyap and chairman of the State Cooperative Bank KR Balnatah and other prominent leaders. The issue of allowing construction in the 17 green belts which were declared no-construction zones following a notification in December, 2000, had been discussed before Chief Minister P.K. Dhumal while he reviewed the functioning of the Town and Country Planning (TCP) Department. Now it has been decided to put up the report of the committee headed by Director, TCP, before the Cabinet so that a final decision in this regard could be taken. The government had constituted a high-level committee with senior officials of the TCP, the Urban Development, the Revenue, the Municipal Corporation, and the Forest Departments on February 2, 2008, to take a fresh look at the issue of allowing construction in the 17 green belts in the town. The report of the committee has been pending before the government since October last year. There has been complete ban on constructions in the 17 green belts spread over 414 hectares in the town since December, 2000. According to sources, the police has registered a case of arson under Section 435 IPC at the Gohar police station on a written complaint of Vinod Kumar, block officer, Bassa. He charged that Kapoor Chand, a resident of Kotla, Chachiot, burnt the DPF Forest Bhawan in which about 300 trees were affected or burnt. This is the first-of-its-kind case registered against the accused in the case of forests fire. In the second case, the forest department lodged an FIR at the Gohar police station in the case of forest fire triggered in the DPF Dran on June 12 in which over 250 samplings of “chil” were burnt or affected. But the police had yet to identify the culprit. Mandi SP Sonal Agnihotri said the police had started the investigation after an FIR was lodged on the complaints received from the forest department. The police has registered a forgery case following direction of the court last year. According to DSP Hari Ram, the deceased had executed the will in favour of his two sons- Malkiat Singh and Satnam Singh in 2006. However, while executing mutation of the will after Santokh Singh’s death the accused allegedly tempered with the will and entered the names of the deceased’s mother and wife. He said the police after investigation and examination of the will found that additional names had been entered in a forged manner by tempering with the document. According to the police, two persons were killed when their Santro car (HP-03-1458) met with an accident, near Laffughati. While Chain Singh of Satra village and Balbir of Khiler died, four persons sustained serious injuries. The injured have been admitted to the hospital. In another accident two persons were killed and one injured when their car met with an accident, near Saryun. The two killed are yet to be identified. Praveen Kumar, truck driver (HP-63-5015), died in an accident near Sunni. A Nepalese yet to be identified was also killed when the truck rolled down into a khad. Another local Biru Ram has sustained injuries. MANDI: One passenger died and 24 others were injured in four different road accidents. Driver Raju died on the spot while Balbir Singh from Bangu Jhakhar (Ani) sustained serious injuries when their vehicle (HP02A-0307) on its way from Kotlu to Nanj on Karsog road rolled down into a nullah. Twenty-one tourists travelling from Kanpur to Manali in a private bus escaped with minor injuries when the bus (UP78-AT-8088) they were travelling in hit sideways and turned upside town at Sambal, near here, on Monday morning.